Full Day fishing charter = more types of fish. Limited to 6 persons outing with departure times adjusted based on time of year & weather. trip includes all fishing gear & tackle, fishing license, bait, ice, drinks, fish cleaning & bagging. A full day fishing trip gives you a little more leeway regarding types of fishing we can do. With a full day, we have more time to head out to deeper trolling spots and bottom spots. We will be targeting Mahi, Wahoo, Blackfin Tuna, Sailfish, and Bonita. We can chum for fish, troll ballyhoo, kite fish with live bait. Anglers Envy tries to use the best tactics to put you on fish and put fish in the boat. The beauty of this trip is there is time also to do some bottom fishing. Full Day Exclusive Fishing Charter for up to 6 person. Departure Time 7:00 am. (Time may very on season and weather) Located at Blue Points Marina, Cape Canaveral. No fishing license required. Tackle, bait, Ice, fish cleaning and bagging included. Drinks available upon request with 48 hours notice. 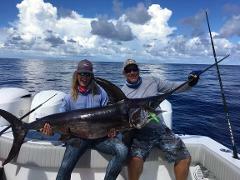 Swordfish charter find your dream catch. Limited to 6 persons outing with departure times adjusted based on time of year & weather. trip includes all fishing gear & tackle, fishing license, bait, ice, drinks, fish cleaning & bagging. Looking to spend a day going after your dream catch, we have the trip for you. A full day of Swordfishing. Our crew will give instructions on how to operate reels as well as how to look for the bite and set the hook. Bring your patience on average we get 1-3 bites a day. But if you're looking for a Trophy Fish, it doesn't come easy. Priced at $1900.00 plus fuel. Searching for Yellowfin Tuna on the other side -this is your trip. Limited to 6 persons outing, departure times adjusted based on time of year weather. Includes all fishing gear & tackle, fishing licenses etc. Have you always wanted to travel to the other side of the Gulfstream in search on Yellowfin Tuna, Marlin, Wahoo, and Mahi? Well, Anglers Envy can make your dream into reality, get on board and relax for your journey to the other side of the Gulfstream, where fishing pressure doesn't exist. It's a little over 2 hours in our boat depending on weather conditions to get you into prime fishing grounds. Daybreak is the time to catch the Tuna; we will locate birds using our radar then pull in front of the schools of tuna and drop our baits back. And hopefully, it's game on. 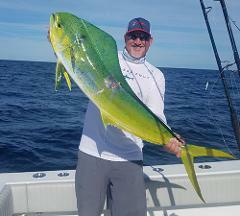 The Mahi fishing on the other side is incredible at times, big aggressive fish chowing down your ballyhoo. So get ready to strap into your harness and hang on. With this great adventure, the pricing is $1,900.00 plus fuel. Looking for a new and exciting adventure, looking to catch some fish that are on your bucket list? Limited to 6 persons per outing Your trip includes all fishing gear and tackle, fishing license, bait, ice drinks, fish cleaning & bagging. Are you looking to cross off numerous species of your bucket list, if you are this might be the trip for you? Anglers Envy Charters have pioneered deep dropping out of Port Canaveral, FL. We have spent numerous days perfecting techniques and locating spots to give you the best chance possible to land that 30lb Golden Tilefish, or a big Snowy Grouper, and don't forget the delicious Yellow Edge Grouper and Blueline Tilefish. Anglers Envy also offers Manual Reels for customers that want the challenge of hand-cranking these beasts up from the deep. 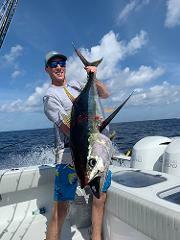 This trip is a full day, so if the bight slows down on the deep drop we are giving our anglers some exiting options such as trying to catch a Swordfish, or maybe doing some trolling for Mahi, Sailfish, or Blackfin Tuna. Or maybe just doing some bottom fishing for Vermilion Snapper, Triggerfish, Porgies, Red Snapper and Amberjacks. Fishing Charters are limited to 6 persons per outing with departure times being adjusted based on time of year and weather. Your trip includes all fishing gear and tackle, fishing license, bait, ice, drinks, fish cleaning, and bagging. A 3/4 day of fishing aboard the Anglers Envy will include usually a short run 30-45 minutes, out to around the 130-foot mark. There we can troll for Mahi, Wahoo, Blackfin Tuna, Sailfish and Bonita. In addition, we will be close to numerous bottom wrecks and reefs to do some bottom fishing for snappers, groupers, triggerfish, porgies and other delicious fish. The above rates do not include gratuity with a standard procedure in the fishing charter industry to tip 15-20% for quality service…. We intend on providing you with the best experience so any gratuity is appreciated and is a large portion of our income. Fishing Charters are limited to 6 persons per outing with departure times being adjusted based on time of year and weather. Your trip includes all fishing gear and tackle, fishing license, bait, ice, drinks, fish cleaning, and bagging. Catered food available upon request with an additional charge.